Our team has been creating software for developers since 2016. Our IT-project was originally initiated by the Gosstroy Group, a major Russian real estate development holding, est. in 2009. Today, the development portfolio of Gosstroy includes 14 completed residential and commercial objects, as well as 13 under-construction buildings with total area of about 150,000 sq.m. By construction volume, Gosstroy is one of Top 150 developers in Russia. In early 2017, the IT Division of Gosstroy was separated as an independent business and registered as INTRO TECHNOLOGY RUS, JSC. In early 2018, the company had 42 staff members and about 20 freelance contractors. The main profile of the company is the creation of Business Intelligence System for off-plan property investors, as well as the development of IT-products for business and state actors. The rapid growth is largely caused by the growing demand for BI systems from market players and regulators. Over 20 construction companies, several governmental agencies and industrial associations is now using the products of INTRO RUS. Our users include the representatives of National Association of Housing Developers, Union of Construction Companies of Ural and Siberia, Chelyabinsk Interregional Union of Builders and other professionals from 18 parts of Russia, where INTRO business is present. However, the potential of scaling of our BI system is not limited to the market of Russia and the CIS countries. According to our research, more than 10 million homebuyers a year invest in off-plan properties in the BRICS countries. Most of the residential property in India, Brazil and Russia are sold at the construction stage. Still, offplan development remains a risky investment due to low market transparency. We were the first to use AI (Artificial Intelligence) to collect and process data on off-plan development investments from the official state registries. Now our system INTRO Analytica quickly processes raw data on property rights claims, helping to create accurate market forecasts. At the next step, we plan to integrate the blockchain technology for data protection and secure transactions between developers, investors and home buyers. 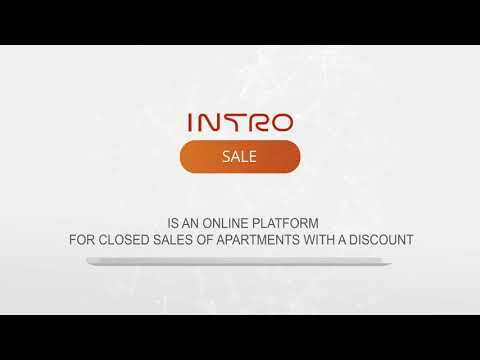 "INTRO is an Ecosystem for real estate market players. Already today, the system has more than 6800 objects from 1800 developers, which you can buy with a discount of up to 30%." How did you derive this 30% discount? Very strong team. One of the best advisors. MVP is ready. KYC passed. Real Estate is really very big market and if you will right use your force and experience you can be a very successful ICO. Good team with high profile advisors. Vision is interesting and it is good to learn that real estate is not tokenized with blockchain using smart contracts. Could not test the product as it is in Russian I guess so it is hard to rate. Good team and advisory board... Also have a nice app too.... But there are lots of competition on the market right now so proper kind of marketing can only make a project successful. Strong team with a good vision. Great advisory board. Working MVP. Considering the skyrocketing real estate prices in the world, this ICO is very likely to be successful. Now a lot of crypto projects appear on the real estate market. Competition is good. The project has a well-developed strategy and a strong team. The question is how they will enter foreign markets. And how long the project is ready to wait for changes in the legislation in the field of real estate in blockchain. I like the project, but for crypto speculators it makes no sense to invest in real estate. looks like the first real estate project with blockchain that really may be interesting. Tokenization not real estate directly but discounts. And not another "money" token, but just utility-token that gives it's owner ability to take a discount. Great vision! This feels like a breath of fresh air. First real estate blockchain project that's actually looks promising. It's got a solid team behind it with a great advisor. If they can execute it well, they have a winner on their hands. All the best! Great team strong advisors , profitable company . This is a finished product not a Whitepaper Ico ! Strong team of advisors. Good business use case of the blockchain. Great use of blockchain real estate. Team - good experience and education in core team, some good coverage from advisors. There does need to be more resources for compliance and regulations if they are to become finance brokers with their 0% finance initiative, however. Vision - good vision, well explained. The offplan contracts need to be watertight, or there could be a lot of developers taking deposits and disappearing overnight (see Liverpool property market as prime example of these tactics). As above, the jurisdictional regulations for becoming finance brokers need to be considered further. It's a little worrying that the WP gives potential RoI stats as this implies, from a regulatory view, that the tokens are securities under the Howey test. As the token sale appears open to US investors, there should be consideration made for this. As such, it's a 3 here until the question marks over regulations and compliance are cleared up. That's not to subtract from what is a really good idea, however. I'd just rather see all potential issues with execution cleared up before giving a 5. Product - MVP available, working and user friendly. All in all, a good idea with a couple of regulatory questions to clear up before gaining top marks across the board. Good luck to the team in the execution of the project. Good initiative, real estate off place market ratings and Data analysis platform to analyze developers, helps investors, buyers and brokers. Look forward to the prototype. Good luck. Hardcap is quite small. Solid and experienced team. The product promises to be impressive. Interesting concept. Am interested to see where this project goes a year from now. Good package at an upcoming sector. Very impressive team and advisory board. MVP is there, although I would like to see Alpha as well. KYC passed. Clear vision and solid product and market potential. The team behind this project looks pretty competent but i do not see how this project will stand out from the rest. We have seen countless similar real estate projects which have failed in the past which some of them are also mentioned in the white paper. I am not arguing that this project does not have any competitive advantage over others but the reason that most of these projects fail is that many people cannot get so easily used to the new technologies including blockchain. This projects counts on the interaction between those people. I find it really hard that they will start using this platform. So many positive comments I have made. Yet my gut still tell me this is not a good one to invest in. Every once in a while you come across a great ICO project. It’s already up and running and the Russian Market is huge with much more growth potential. The concept is smart and the vision is even better backed by an experienced team. This ICO deserves 5 stars across the board and I wish the INTRO team a lot of success. Advertising with a discount of 30% for real estate development investors makes me sceptical. Real estate is not like buying shoes were you get 30% off. It is a market that opts for the market equilibrium. The only real advantage of INTRO is the usage of smart contracts. A Crowdfunding Plattform with Real Estate projects basically offers the same value as INTRO, there is no need for a Blockchain implementation. Hello. Thank you for your opinion. If you go deeper into the study of our project, you will find answers to your questions and your skepticism will be dispelled. How is achieved up to 30% discount on real estate when buying through the platform? 1) Up to 15% of costs is saved on intermediary services of the real estate brokers. The brokers add own margin on re-sold properties and also charge the fees for property selection, legal check and property bookings. All these services are available in the INTRO ecosystem. The selection and booking is performed by property buyers themselves. The legal check is conducted automatically by generating a request to the state property register and providing a record on property development & ownership. 2) Up to 15% of costs is saved on mortgage brokerage and bank interest. These costs may vary depending on the location, property type, contract terms and customer’s credit history. 3) Additional costs are saved on market research, fees for property check up and security services for the real estate deals. In INTRO Sale, the property rights transfer is secured by smart contract with the penalties for terms violations on both sides (e.i., seller and buyer). In traditional property deals, a bank or a notary serves as a security warrant’ and charges 2-5% for the service. What are the technical advantages over competitors in a decentralized environment? Good luck on this one...curious to see this project progress! This idea has the power to save lots of waste money. Team: Strong team, many well-known advisors. Other team members seems knowledgeable also. Vision: Real estate markets are huge, there enormous amounts of money to be made. If this project can deliver what they are promising, only sky is the limit. Product: Real estate markets are extremely competitive. There are many real estate related ongoing ICOs, although the idea is different from others, it still requires a lot of work to make this project differ. Good team and excellent choice for the domain of Blockchain can leverage. Huge potential market, it is a good product for both investors and sellers. Good luck! Solid team and advisor. Everything looks great so far however it’s definitely a competive market to be into. They are latr players to the market. Want to know more about their execution strategy on how they will take over the market. The idea is good, and the team have good view. hope it cloud go live and change the world soon. The industry is clearly not transparent, this project make sense, but I don't see how they will make sure the developers will play the game. It's not about blockchain, but about processes, and moreover in various cultural environment (team is not truly international).